Yeah, MAKE that progress! Just 99.9% of the application to go and I'm there! If you’ve followed the last two updates, you’ll know that in a period of ten weeks I’ve made just the odd hour or two of progress on my iPhone game. Indeed, given that most of that time is required just to figure out where I was and that the SDK keeps changing it’s fair to say that the list of things that I need to do is growing faster than I’m not clearing it. It actually feels as if I am going backwards, as though my software is un-programming itself and that soon, in a few months, the source code will reach zero bytes, remove itself from the repository and the local copy place itself into the trash can. Code germs will roam the world attaching themselves to the backups and will munch each byte into oblivion. Finally, my braiiiiin will forget that I ever started on the project and this blog will be the only record that the project even existed. As it happens I find myself with a few extra hours today that I didn’t expect to have. Whilst there are things to do, I have decided to fit a Map Editor for the game in and around those other things. It’s extreme programming. As in “extremely over-optimistic”. Needless to say, I suspect that at the end of today I’ll come back to this post and… um… “accidentally” edit it to change this to something less grand than completing a Map Editor. If you’re reading this after the 23rd of May, perhaps it merely suggests that I’ll download the latest SDK and sort through my documentation. 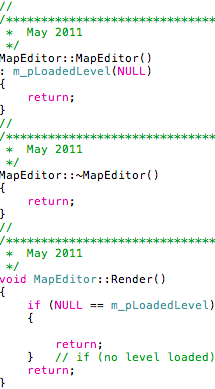 Anyhoo, Mr Map Editor isn’t going to program himself, despite my hopes, so I should get cracking. As you can see from the image, I’ve not made much progress yet, but the day is young, the clouds are ominously grim and the coffee machine is on. I do, though, have a decent framework running and I have boiled the problem down to the actual Map Editor functionality itself: i.e., the next line of code I write is progress on the problem rather than preparing for the problem. Gotta love Cocoa for that — it’s insanely easy to get to this stage. This entry was posted in My iPhone game and tagged braiiiiins, iPhone, map editor, schedules, slow progress. Bookmark the permalink.